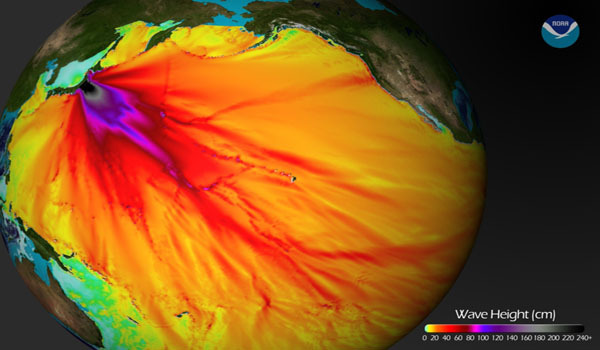 Pakalert Press » How Badly Is Fukushima Radiation Damaging the Pacific Ocean? I watched some wonderful movies over the summer with “ocean” themes and one was with Robert Redford called All is Lost. The entertainment value was good but it also made a statement about Man’s interference with Nature and how nature can strike back. I love films like All is Lost, Master and Commander, in which the imperial navy visits the Galapagos Islands and “Kon Tiki,” a story about a 4,000 mile trek across the ocean, because they show the unspeakable beauty and power of the world’s great oceans. Can humans actually destroy them? Over the past year we’ve read many news stories about mass die-offs of marine species in the Pacific Ocean and other regions. One hypothesis in the alternative media is that the massive radiation released from the Fukushima nuclear disaster is the cause. Others blame over-fishing, pollution or climatic events. My opinion is that if the die-offs are unusual and “man made” then it is a combination of factors, but Fukushima is probably one of them. The Earth is under many human threats — we are an industrious species — Fukushima is doing the ocean only harm, and following that logic, at a minimum the health of local species and perhaps wider ecosystems are being affected in a reverse synergy whereby organisms have surpassed the limits they can endure. Folks love to argue about whether things like radiation has killed the ocean; whether global warming is real or not or caused by humans emitting CO2; or whether the Twin Towers on 9/11 were brought down with nanothermite or mini-nuke explosives. But in all three cases the harm that has been caused is uncontroversial. We should stop polluting the environment with harmful pollutants (such as sulfur dioxide from coal burning plants) and promote renewable energy sources; we know the official story of 9/11 is a total lie regardless of how the buildings were demolished (see, for example: Architects and Engineers for 9/11 Truth); and we know that whatever amount of radiation is leaking into the ocean it is a bad thing and needs to be stopped. It appears that after three long years a group of scientists are finally going to have a meeting to discuss the effects of Fukushima on wildlife (2). Logical discourse, debate and scientific honesty are essential to finding consensus on how to solve the problem. However, our scientific and political institutions are often so inflexible that it’s not easy to change course or offer reforms for improvement. And, let’s face it, our economic and political system is rotten to the core (3; 4; 5; 6). Tokyo Electric Power Company (Tepco) is the utility in charge of the (FNPP #1) Fukushima Nuclear Power Plant No. 1 (“dai-ichi). They recently admitted that FNPP#1 is releasing a whopping 150 billion becquerels of tritium and 7 billion becquerels of cesium and strontium of contaminated water, every day, into the ocean (7). Compare that to the Japanese government limit for food that does not allow over 100 becquerels per kilogram in food to be sold as produce. It is estimated by the State of California Natural Resources Agency that the initial Fukushima accident released nearly double the amount of radiation compared to Chernobyl (8). No human worker can enter the areas around the FNPP#1 reactor buildings because it measures up to 10 sieverts per hour (9) due to the melted nuclear fuel which is scattered at various locations beneath the reactors. 10 sieverts equals10,000 millisieverts (a lifetime dose should not exceed 100 ms!) or 10 million microsieverts per hour, when a normal background rate might be around 0.05 up to 0.15 microsieverts per hour (10). NHK claims the melted fuel has “cooled down” but so what? The Abe-controlled NHK wants to reassure the public with sugary, sprinkled donut language that “all is well” in Fukushima (11). If you compare the mild non-coverage that Fukushima gets in the Japanese domestic media versus the compendium of worries that independent researchers and scientists have documented it betrays the level of denial and helplessness on the part of the Japanese establishment versus grim reality (12). Dr. Tim Mousseau has carried out extensive biological research at both Chernobyl and now Fukushima prefecture and found the same patterns of genetic mutations and damage to insects, birds and other organisms caused by the high doses of radiation released by the accidents (13). In 2013, Dr. Chris Busby, an articulate chap of enormous integrity and “an expert on the health effects of ionizing radiation and Scientific Secretary of the European Committee on Radiation Risk,” stated — in a fascinating interview about how the Nuclear/Military Industrial Complex buys their own scientists in order to produce fabricated results — that Fukushima is “probably the worst public health scandal in human history” and that the “actual background rate for thyroid cancer in Japan is actually zero…[according to] a study done in 2005” (14; 15). The background rate before the disaster was zero. It was recently announced that “[t]hyroid cancer [was] diagnosed in 104 young people” in Fukushima. However, “government officials in Fukushima say they do not believe the cases of thyroid gland cancer diagnosed or suspected in the 104 young people are linked to the 2011 nuclear accident” (16). The article does not offer a counter argument for what might have caused the cancers, but some dissenting experts do think Fukushima is the cause. Oddly, the government is not carrying out thyroid cancer research in other regions farther away from the disaster site such as in Kagoshima or Okinawa in order to compare the data, and are apparently ignorant of the study Chris Busby dug up that indicated the zero incidence background rate prior to the disaster! The United Nations, whatever its good intentions, which controls the IAEA who in turn oversee global nuclear affairs, is a compromised institution when it comes to regulating the Nuclear-Military Psychopaths (NMP) (18). a highly statistically significant 37% increase in childhood leukemias within 5 km of almost all NPPs [nuclear power plants] in the UK, Germany, France and Switzerland. It’s perhaps not surprising that the latter 3 countries have announced nuclear phaseouts and withdrawals. It is only the UK government that remains in denial (19). Considering the Nuclear Cartel’s control over Japanese politics, blatant denial of statistical data in Europe and the way the UN is compromised, it’s unsurprising to find that the Japanese government, prone to byzantine politics and opaque political processes to begin with, would lie about the effects of radiation on children. “The Health Survey has been less than transparent in what data they release. Many times the data given makes it impossible to perform any sort of outside analysis or obtain a clear picture of what is going on. The survey has refused to release any sort of raw data or additional information in a way that allows for … review or confirmation that their reports accurately present the real situation” (20). Recently Dana Durnford who is true citizen-hero, is also a resident, fisherman and diver of the British of Columbia coastal area of Canada. He and a colleague did a survey of 200 km of the BC coast and found it to be practically lifeless of many normally thriving species (21). This is unprecedented according to Durnford who has lived and worked in the region for years and knows the topography and ecology there like the back of his hand. Is the cause due to Fukushima radiation? This article from Washington’s Blog (WB) has some good maps that show how ocean currents are sweeping Fukushima radiation toward North America (22). The big question is about dispersion of radiation in the ocean: does it disperse and dilute and become harmless or is it concentrated enough to have an effect? A fisheries expert cited in the article argues that radiation is not the cause but WB refutes some of his claims. An anonymous person in the comment section purports a theory about radiation killing the plankton thereby screwing up the ocean ecology. It sounds like a reasonable hypothesis to me that should be investigated. Returning to the argument of Dr. Chris Busby, while a lot of people make big statements about the death of the Pacific, he uses mathematical calculations to make his case. I have not seen his figures either verified or disputed by other scientists. In his audio interview he noted he is aware that all of the radiation will not dilute uniformly and that various currents will concentrate the radiation in certain places but he does not believe the radiation will cause an ecological catastrophe because the ocean is just too darned big. Busby does emphasize the danger to Japan especially people living in the vicinity of Fukushima, but notes that even if the entire inventory of radioactive materials were to make it to the ocean, that the above ground atomic bomb tests released more radiation than Fukushima could. If we add the bomb tests plus Fukushima, maybe the accumulation is something to worry about. The…Pacific Ocean is big enough for this level of release not to represent the global catastrophe that some are predicting. Let’s get some scoping perspective on this. The volume of the North Pacific is 300 million cubic kilometers. The total inventory of the four Fukushima Daiichi reactors, including their spent fuel pools, is 732 tons of Uranium and Plutonium fuel which is largely insoluble in sea water. The inventory in terms of the medium half-life nuclides of radiological significance Cs-137, Cs-134 and Strontium-90, is 3 x 1018 becquerels (Bq) each. Adding these up gives about 1019 Bq. If we dissolve that entire amount into the Pacific, we get a mean concentration of 33 Bq per cubic meter – not great, but not lethal. Of course this is ridiculous since the catastrophe released less than 1017 Bq of these combined nuclides and even if all of this ends up in the sea (which it may do), the overall dilution will result in a concentration of 1 Bq per cubic meter. So the people in California can relax. In fact, the contamination of California and indeed the rest of the planet from the global weapons test fallout of 1959-1962 was far worse, and resulted in the cancer epidemic which began in 1980. The atmospheric megaton explosions drove the radioactivity into the stratosphere and the rain brought it back to earth to get into the milk, the food, the air, and our children’s bones. Kennedy and Kruschev called a halt in 1963, saving millions (Op. cit.). Mainstream science websites like Deep Sea News posit that there is no threat whatsoever from Fukushima radiation, yet devote very little attention to the issue other than to deride those are worried about it (23). In one of their rare articles on the topic I read some months ago, there had previously been a long and thoughtful debate in the comment section among some of their critics, even mainstream scientists, who chastised DSN for so handily dismissing the radiation threat. Recently when I checked the site all of those comments had been deleted and no new articles on the topic had since been published. Only those who cheerlead for their website are allowed to publish comments. Science follows funding, and promoting the anthropogenic theory of global warming (AGW) pays better than locking horns with the nuclear industry (big bucks military industrial complex). In the meantime, promoters of Al Gore’s official religion, AGW, had to come up with a computer model to explain why global warming is on hiatus until 2030, but don’t worry, it will be back and so will their funding (24). The Cosmic Convergence Group has just published a lengthy essay that goes into multiple causes of climate change, and while acknowledging the reality of AGW disagree with the way it has been over emphasized and politicized and instead offer a scientific analysis of complex, interrelated phenomenon (25). I think its a state-change in the Pacific eco-system and that Fukushima was simply the precipitating catalyst (26). Entropy was rising in the Pacific for many reasons but whole-scale chemical and elemental contamination (e.g., lead, mercury, uranium, strontium) had already pushed the world’s oceans towards state change. There are also quite a few earth changes that have increased ocean acidification. I really think the climate change problem distracts from the more encompassing problem of broad scale eco-system collapse. (Maija Nadesan, personal email communication, August 29, 2014). There is lots of debate about this issue with die offs. Much of what has been cited since 2011 had documented problems or previous similar die offs prior to Fukushima. What is the big unknown is that the radiation releases from Daiichi are still very much up for debate. This gives me pause every time I see some declaration that there is no problem of any kind and never will be related to the Pacific. Until we all have a better scientific grasp of the actual releases into the Pacific over time it is impossible to make solid projections. Most of the estimates on Pacific contamination that I have read only used the initial sea releases as their basis. So they do a good job of estimating where contamination might circulate. But if they only account for the initial release and not the additional over time releases, their estimate will be low. The big question is how low. Are they just slightly lower or are they considerably lower? What matters then is what were the actual releases to the sea over time. Right now nobody is doing comprehensive and unbiased research into this, or if they are they haven’t published it yet. So there is a knowledge gap. Recently TEPCO admitted to much larger sea releases over time since 2011 than they had previously admitted to [currently 157 billion becquerels per day!]. There were some oceanography experts that had called TEPCO’s previous figures into question as their readings were showing there had to be an ongoing release because the readings they were taking were not sufficiently going down over time. So the big question is the difference between these estimates currently being used for Pacific projections and how these new admissions might change those. As far as dispersal. It appears to be a little of both based on the published studies and what oceanographers seem to be most interested in monitoring. It will dilute to an extent, but it will also follow currents and there is some research that found concentrations higher in certain levels of the sea depths. There is also the known issue of cesium concentrating in the sea floor. Much of the research has focused on cesium but from the new TEPCO findings strontium 90 is an equal or larger concern and it isn’t being monitored or tested for in the sea the way cesium is (personal email communication, August 27, 2014). In 2013, yachtsman “Ivan MacFadyen says he was shocked by absence of sea life during his 37,000km voyage between Australia and Japan” and described the Pacific Ocean as “dead” due to “severe overfishing.” He reported that the ocean was strewn with “copious amounts of rubbish” and that “[i]t started to strike me the closer we got to Japan” the deader the ocean became (27). There are multiple causes to the destruction of the flora and fauna of the planet including pollution (from rubbish to radiation), habitat destruction, poaching/over harvesting of species for human consumption and even geophysical disruptions that are now taking their toll on marine habitats. Whether or not you share the eschatological position of the website, End Times Prophecy, I was amazed to come across this list of animal die-offs at their page, “Mass Animal Deaths for 2014.” It is truly horrifying and appears to be entirely verifiably, factual information (28). We do have to consider that throughout Earth history there have been population explosions followed by die-offs, and that in the past, before the Internet, many of these occurrences were not so readily documented for public viewing. Still, there seems to be a pronounced and disturbing pattern here that is not just a random collection of information. It is hard to detect the severity of this state-change to the natural world when viewing the complacency and normality of daily affairs in Japan. Sushi restaurants all over Tokyo are packed with customers as if nothing ever happened. Most people, although against nuclear power now, are apolitical and apathetic and will do pretty much whatever the government lays out for them (hey sheep the abattoir is over there!). This is evident as the economy stagnates, the nuclear issue remains unresolved and yet Prime Minister Abe keeps pushing to increase Japan’s military and nuclear capabilities. Understandably the farmers in Fukushima are suffering due to the disaster which had nothing to do with them in the first place. Someone else’s mistake (Tepco’s) has cost them their livelihoods. In reality, Fukushima prefecture is quite large and I would guess the other side of the region does not have that much radiation, but because the name “Fukushima” is affixed to a food product many people will avoid buying it for fear of radiation. That said, one wonders about the wisdom of campaigning the rest of the country to gobble down Fukushima’s delicious produce. Seafood will have to be monitored for a long time, if not forever (29). And yet one 5 star hotel in Japan is trying to support Fukushima by serving its food on their menu (30). However, Japan is having a hard time getting other Asian countries such as Hong Kong to accept their exported food (31). I live in Tokyo and personally avoid buying any produce from the northeast or Tokyo regions, although sometimes it is unavoidable. The radiation from Fukushima’s nuclear explosions spread hot particles and all assortment of radionuclides across Japan, North America and even the entire world. No one is safe. All of this mess could have been avoided. As the world’s leading renewable energy expert, Amory Lovins has shown, renewables such as solar and wind could offset the need for nuclear and fossil fuel based energy sources for many countries including Europe, the US and Japan. Probably for the entire world. Even the bastion of capitalist ideology, perhaps following the lead of investors like Warren Buffett, Forbes magazine, is promoting wind power over nuclear as having greater scalability, meaning that wind power versus nuclear has “the ability of a system, network, or process to handle a growing amount of work in a capable manner or its ability to be enlarged to accommodate that growth” (36). If there is anything capitalists love it is growth of their assets so maybe they are waking up to saner options. Finally, please keep an eye out for the upcoming book on Fukushima entitled: Fukushima: Dispossession or Denuclearization (2014). It should be published within the next month or so and is an anthology of articles by a wide variety of independent-minded journalists and scholars of unique talent written in order bring into sharper focus the implications of the Fukushima nuclear disaster. Some of the proceeds from the book will be donated to help children refugees who are still suffering in temporary housing situations in the Fukushima area. Richard Wilcox is a Tokyo-based teacher and writer who holds a Ph.D. in environmental studies and is a regular contributor to the world’s leading website exposing the Fukushima nuclear disaster, Rense.com. He is also a contributor to Activist Post. His radio interviews and articles are archived at http://wilcoxrb99.wordpress.com and he can be reached by email for radio or internet podcast interviews to discuss the Fukushima crisis at wilcoxrb2013@gmail.com. 23. Is the sea floor littered with dead animals due to radiation? No. 26. Animal Anomalies: Is the Fukushima Daiichi Disaster a ‘Tipping Point’?